This was very tasty! Go buy a jar of kalamata olives instead, add a splash of red wine vinegar and some garlic and it's even better! Very colorful salad. I added 1/2 tsp. salt based on previous comments. I also will add a little more oregano next time. Great recipe! Great combination of flavors-loved the dressing too. Just the right amount of oregano. 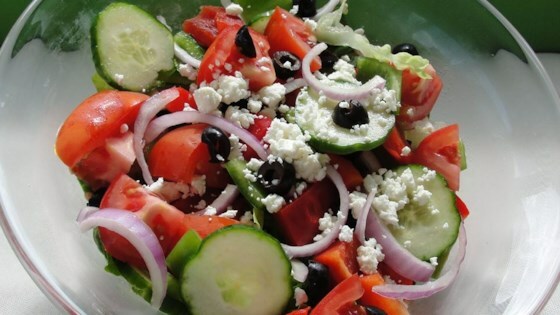 An INGENIOUS Greek salad recipe... absolutely loved it! Full of flavour, delicious, hearty and, although best when freshly made, still takes pretty good a day later!